The Sometimes Preacher | Page 9 of 91 | Reflections on Jesus, Scripture, Theology, Ministry, and Church. 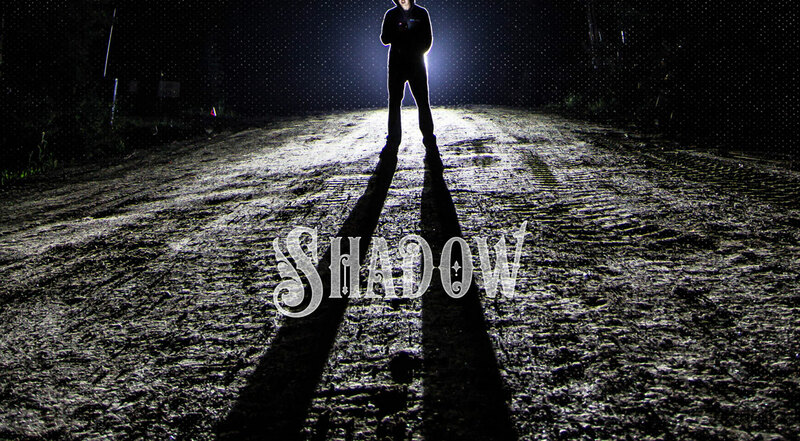 A good filmmaker knows how to terrify his audience with just a shadow. You never have to see the actual monster to be gripped with fear, just the long dark outline suggesting how horrible and mutilated the beast is. Of course, this same effect is used as comic relief when the strange shadow turns out to be a cuddly kitten. We are frightened by shadows because we fear what might be casting them. Rarely, however, do we mistake the shadow for the real thing. But this is precisely what Paul warns us about in Colossians 2:16-17. He said that the food laws and holy days of Judaism were not the real thing that devout Jews thought them to be. The real thing, he said, is Jesus. Jesus is the reality to which religion points. All the things that we might think are so important – obeying religious laws and customs, observing holy days – find their fullness in Christ. Religion is good and true as long as it is centered on Jesus. It is good to obey the rules, but only if we are acting from a heart that is devoted to Christ. 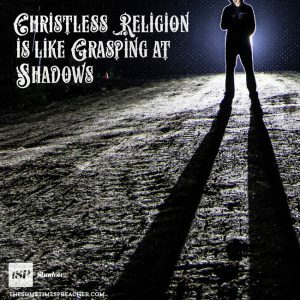 Christless religion is like grasping at shadows. It’s not that religion, ritual, or rules are unimportant. Nor is it that they mislead us. It is that they are empty apart from Jesus. 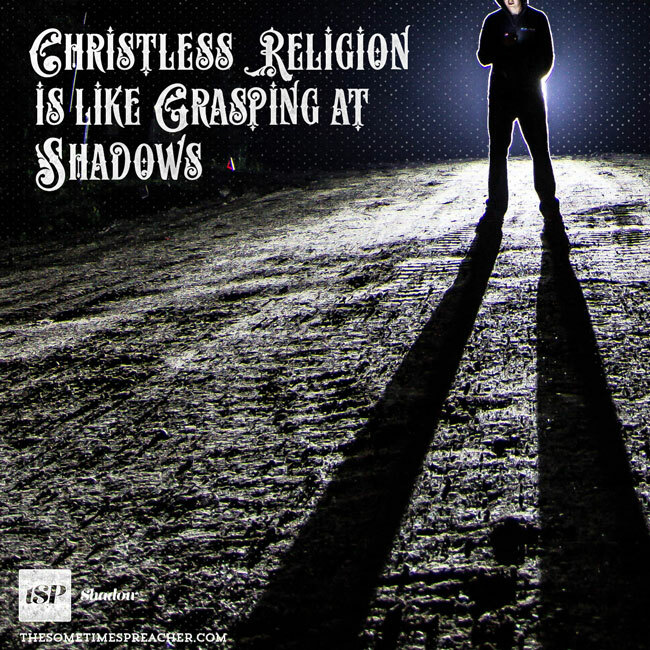 If you feel that your religion has grown stale, that the rituals of what you do at church or in your daily devotions has become mere routine, it is time to lift up your eyes and see who is casting the shadow. Jesus is the real thing. It’s time for you to re-center your life and your religious activity around him. We drift so easily. We so quickly relapse into following shadows instead of worshiping the reality. Here is a prayer to help you re-center around Jesus. Cast your shadow across my life. That I may find myself in you. We often think of death as the opposite of life, but that’s not the best picture of the truth. The relationship between death and life isn’t the same as the relationship between left and right, or in and out. Instead, it’s like the relationship between dark and light. Darkness is the absence of light, not the opposite of it. In the same way, death is the absence of life. Being dead in your sins doesn’t mean, of course, that you are biologically dead. It simply means that you are devoid of the abundant and eternal life that Jesus alone possesses and gives. It means that you are lacking, as we all do without Christ, the fullness of life that only the Author of Life can provide. 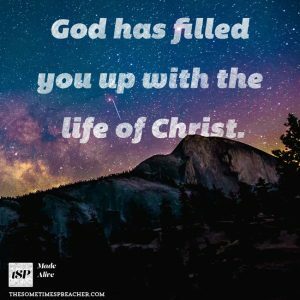 How can you become filled with this life? Through faith in Jesus Christ. 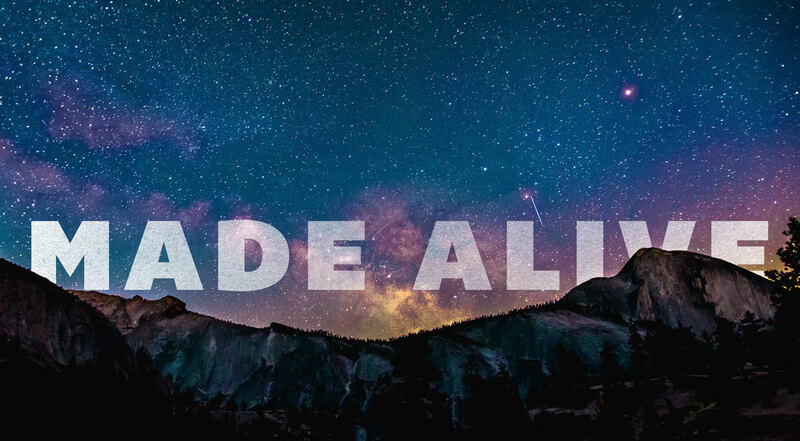 You are made alive with Christ because he was made alive when God raised him from the dead. Placing your faith – your full trust, love, and obedience – in Christ means that you, too, will receive the benefit of his resurrection. But you don’t have to wait until you die to experience new life. You can have it today! Eternal life begins the moment you place your faith in Jesus. Choose life. I have to confess something: I never liked Jerry Maguire. Yes, there are some good lines. Cuba and Tom shouting “Show me the money!” at each other through the phone is a great scene. And Jerry Maguire has a noble purpose in making sports agency more relational. But the plot was hijacked by the romance which was, shall we say, overcooked. “You complete me.” Really? Sadly, however, that may have been the truest line in the film. 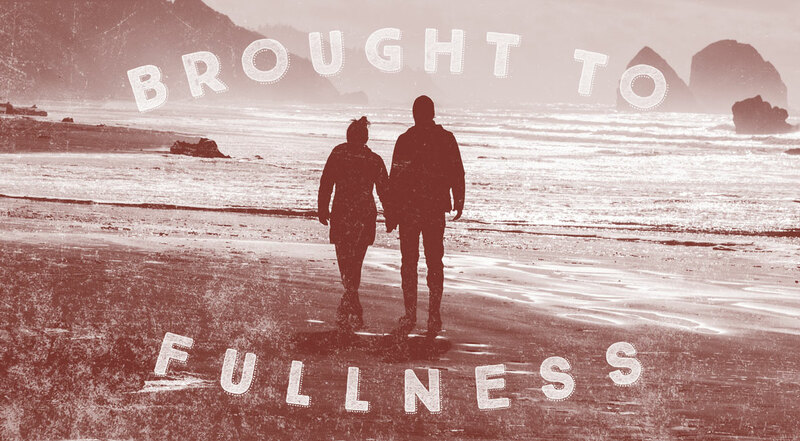 Not that any person can actually complete us, but that we believe: a) that we are at least half empty, b) that we can find our fullness in another human, and c) that romantic love is the only path to this fullness. 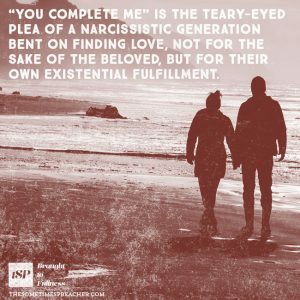 “You complete me” is the teary-eyed plea of a narcissistic generation bent on finding love, not for the sake of the beloved, but for their own existential fulfillment. While romantic love has its proper place, the only love that can fulfill us is the agape love of Christ. 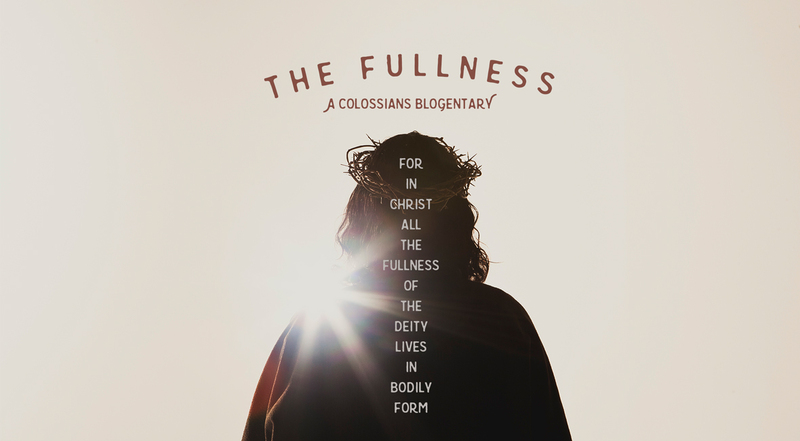 Paul says, in Colossians 2:10, “in Christ you have been brought to fullness.” This means that Jesus has done for us what no one else could do – make us truly and fully human. Our sinful inclinations, what Paul often calls “flesh,” are subhuman. They move us away from the purpose and glory for which we were originally created. But in Christ we are set back on track. Jesus puts us on the train to fullness. In fact, it’s more accurate to say that, in Christ, we have already arrived. He has given us everything we need to complete the high calling of humanity. 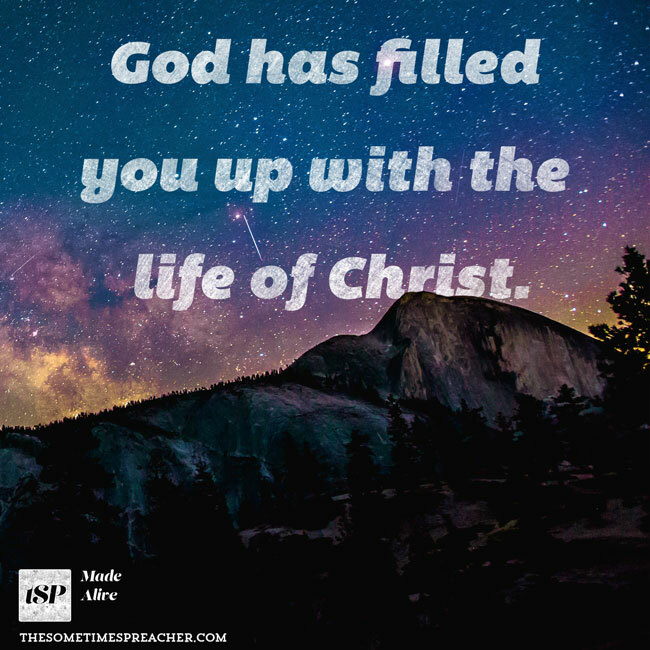 This means that the truest, fullest version of yourself is not the one who gives into sin and temptation or that looks for fulfillment in another person, but the one who lashes himself to Christ and follows hard after God. To be true to yourself is to be faithful to Jesus.